My first response is how can they can say this with historically-low U.S. treasury yields and muted inflation expectations? Surely, if the Fed were truly monetizing the debt we would be seeing a 1970s-repeat in the bond market, but we are not. And this is happening, in part, because the Fed is not that big of a treasury purchaser. Consider the figure below. 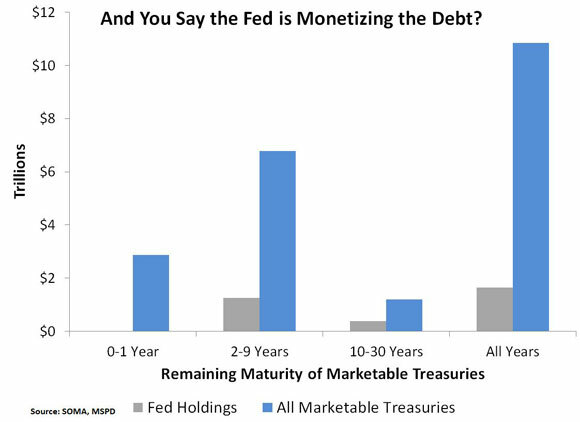 It shows the Fed’s stock of treasuries by remaining maturity compared to the total stock of marketable treasuries as of the end of October, 2012. Though the Fed’s share of treasuries increases by remaining maturity, at most it hits 32% of the total for 10-30 years category. That means that after many months of Operation Twist that roughly 68% of long-term treasuries are still held outside the Fed. 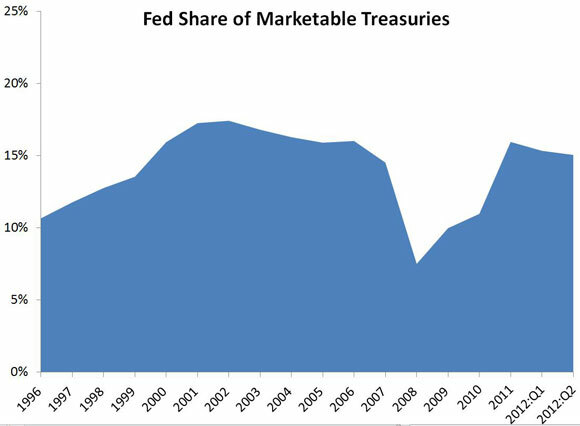 Overall, the Fed holds about 15% of marketable treasuries as seen in the “All Years” category. It is hard to square these numbers with the allegations that the Fed is monetizing the debt. While the Fed did purchase a large share of new treasuries in 2011, these purchases only returned the Fed’s share of total marketable treasuries to its pre-crisis level as seen below. Again, not exactly a picture of debt monetization.